Many children chew and it is our goal at V-TOP to allow kids to do so without being stigmatized. Our necklaces are fashionable, yet also act as inconspicuous sensory aides, which children can feel comfortable wearing in any situation. And all of our teething necklaces are made of 100% food grade silicone and free of metals, lead and BPA. Children of all ages will enjoy the discrete look of these fashionable necklaces that will also satisfy their oral sensory needs. 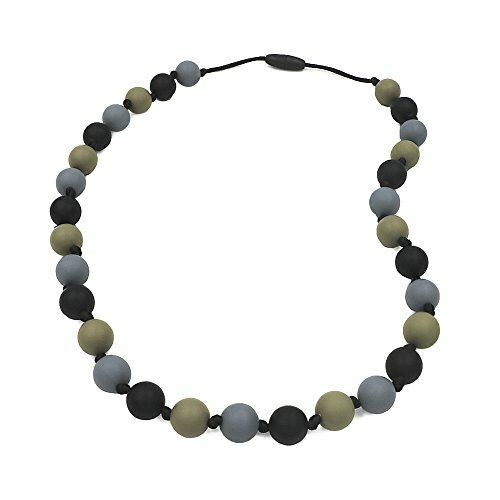 Chew Necklace made with 100% food grade silicone! Passes FDA testing requirements. Diverts chewing from fingers and clothing, perfect for a hard chewer. Chewing beads acts as an inconspicuous, stylish sensory aide strung on a durable cord that features a breakaway clasp for added safety. Boosts confidence and reduces anxiety & cleans easily with mild soap and water, made for mild to moderate chewers. The clean design of The Falcon is discreet and works perfectly for on-the-go oral sensory input. Chewy necklace teether provides superior visual stimulation & supports brain development. Our teething jewelry looks great, fashionable. Help soothe your baby's teething pain and sensitive gums, while maintaining a clean and chic style. Another added bonus is this necklace won't snag your hair. Help your little ones maintain focus, reduce anxiety, and satisfy their need to chew, so they can enjoy their day without munching on their shirt collars and sleeves. If you have any questions about this product by V-TOP, contact us by completing and submitting the form below. If you are looking for a specif part number, please include it with your message.